1. Thomas Merritt, Sr. 1854-1932 lived at 222 Water St. and was a passenger boatman in his later years. He and Nettie were the forbearers of the Merritts in this cemetery. Nettie’s parents were Joseph Francis and Mattie A. Moore. 2. William Henry Keel 1878-1950 has both of his wives on his headstone; however, his wife Beulah Godwin is buried in another cemetery while he is buried beside her parents’ plot. 3. Viola Weeks Davis’ 1882-1957 gggrandfather was Jabez Weeks 1720-1792, the brother of Swansboro’s founder, Theophilus Weeks 1708-1772. William James Davis’ 1877-1932 parents Cicero and Virginia Davis are buried here. 4. William Thomas Casper’s 1909-1970 and Eunice Barnes’ 1907-1994 son is the owner of Casper’s Marina. 5. Mary Virginia Hill 1873-1945 married James Eldridge Parkin 1867-1952 in 1890. They lived at 218 Water St. Three of their daughters married three Littleton brothers: Nellie 1895-1968 married Richard 1902-1964, Neta 1902-1955 married James 1909-2006, and Bessie 1904-1964 married John 1897-1978. Neta and James’ son was Tucker Reed Littleton 1936-1983, a noted historian of Swansboro and surrounding areas. The Littleton Collection is located in the North Carolina State Archives in Raleigh. Olivia Isabel Rouse 1904-1973 married James Elijah Parkin, son of James and Mary. Isabel is infamous for selling the kitchen off of her house at 202 Walnut St.
6. Captain Hamilton Darling Heady 1835-1894 was a mariner. He joined Company “G” during the Civil War and was a member of the Beaufort Harbor Guards. His son Martin Wallace Heady 1855-1914 was a buoy tender with the USCG. Tucker Howland Heady 1889-1942 built his nephew’s home at 203 Church St. (Tucker Littleton House, current Visitors Center.) Mary, his wife, was the daughter of Mary and James Parkin. 8. Mattie Moore Henderson 1887-1910 was married to James Leroy Henderson for only six weeks before her death. Her epithet is similar to many of her husband’s family members buried at Queens Creek Methodist Church Cemetery where James’ father was a minister. “Sweet angle (sic) wife thou wert not given long with me to dwell. From earth’s rude blasts thou are safe in Heaven. ‘Tis well “tis well.” Her parents, Joseph Francis and Mattie A. Moore, are buried here. 9. William G. Holloway 1861-1907 was a laborer at the Swansboro Land & Lumber Company, located where Casper’s Marina is currently. His home was at 207 Elm St.
10. Willalene Barfield Keagy 1917-1997 was a sister of Vida Lee Reid 1912-1997. Their parents were Lofton Barfield, Jr. 1890-1957 and Kate Furlong 1896-1976. Kate’s parents were Thomas H. Furlong and Frances Martin 1866-1923. 11. Thomas H. Furlong 1855-1933 lived at 220 Walnut St. His father Walter L. Furlong 1831-1882 was a retired sea captain, arriving here in 1858 from Ireland. 12. Mollie A. Thomas 1845-1871 died in childbirth. She is buried here with her son John W. B. Thomas under a weeping willow engraved stone. This is the oldest legible gravestone in the cemetery. Mollie’s brother was George W. Littleton. Her husband was William D. Thomas, buried with his second wife in Thomasville, the city that his father founded in 1859. 13. George Washington Littleton 1855-1927 was a net hauler. He lived with his wife Mary “Nellie” Eleanor Smith at 133 Front St. He is the patriarch of most of the Littletons buried here. It is believed that his parents Thomas Sparks Littleton 1819-1895 and Jemima Pierson Cragg 1813-1877 are buried under a road where the current Rolph and Farr headstones are located, 406 and 407 Elm St.
14. Abram Bell 1859-1927 farmed, sailed and finally worked at the saw mills. Abram lived at 204 Walnut St. with his wife, Mary Eliza “Mollie” Rodgers 1867-1932. Her brother Isaac Emory Rodgers is also buried in this cemetery. 15. William Rufus “Willie” Privett, Jr. 1877-1928 lived at 116 Elm St. with his wife Nancy Jane “Nannie” Hatsell Privett 1878-1959. He was a member of the Bogue Inlet Lifesaving Station, and when it merged in 1915 with the US Revenue Cutter Service, a member of the USCG. 16. Timothy M. Woodhull 1872-1952 came from NY with his wife Maude Valentine Albertson 1873-1915 during the building boom. He was a “Master Craftsman”: carpenter, blacksmith, horticulturist, and mechanic. 17. Clyde Robert Webb 1896-1937 married Alice Woodhull, daughter of Timothy and Maude. Clyde was a fireman and a member of the USCG. On his death certificate, his family listed his trade as “fisherman” and his industry as “Ocean”. Clyde’s parents were Charles Rodgers 1873-1951 and Pauline Moore Webb 1876-1955. Charles lived at 2ll Elm St. He and his brother Ernest were carpenters and built Ernest’s home at 307 Church St. Charles and Pauline’s son Richard Tilley Webb 1895-1972 married Lena Littleton 1911-2000. Her parents were John and Retta Littleton. Richard was a fisherman. Note Charles’ daughter’s headstone, Pauline Webb 1901-1922. 18. Hubert Nash Dennis 1912-1988 was a BMI with the USCG in WWII. His parents are here also, William Nash Dennis 1881-1964 and Mary Jane “Mamie” Canady 1884-1969. The Dennis family farmed this area beginning in the late 1700s. 19. Calvin J. Kirkman 1849-1917, a sailor, produced a family of seamen. His son John Edward Kirkman, Sr. built a home for his parents at 217 Walnut St. John and his brother William Lawrence 1882-1959 were surfmen with Bogue Inlet Life Saving Station during WWI. John lived at 102 Waters St. and Lawrence lived at 212 Elm St. His daughter Louise married Andrew Mason. They lived at 204 Elm St. (“Methodist Parsonage”). Andrew also served with the USCG. Another son of Calvin’s was George 1877-1927, also a sailor. 20. Cicero W. Davis 1850-1924 and his wife Virginia Moore 1853-1936 lived at 208 Walnut St. He was captain of a schooner and later in life he worked for Swansboro Land and Lumber. His roots trace back to Davis Island and to Jamestown, VA where his ancestor arrived in 1607. “Jennie’s” parents Capt. Nicholas Starkey 1821-1903 and Rosa Ann Hatsell Moore 1826-1882 lived with them. 21. Capt. Otway Burns Moore 1880-1971 was a fisherman and sailor who married Wenona Albritton 1877-1932. His grandfather was (1805) Tyre Moore. Rebecca Smith (Burns mother) and Mary “Nellie” Littleton were sisters. Their father was Burns Smith. 23. Lena Jones Hill 1876-1961 was married to carpenter William Henry Hill 1866-1939. He and his son Bill were members of the US Life Saving Station and USCG. His parents were Edward Moore Hill and Armecia. 24. Augustus Ward Pittman 1871-1951 was a sailor and pleasure boats captain. 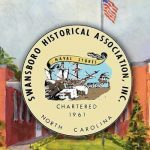 His father John was Mayor of Swansboro in 1896, the same year that he bought the Pittman Store (120 Front St., beside current Russell’s Store.) The Pittmans lived at 308 Church St. Augustus’ mother-in-law Agnes Ward Moore Duffy 1851-1909 was a daughter of (1805) Tyre and Susan Moore. William P. Ward and Augustus are cousins many times. 25. Charles Moore (c.1846-unk) is believed to be the son of (1805) Tyre and Susan Moore. The Capt. A. C. Moore 1835-1892 is yet to be identified as to family members. 26. Martin Van Buren Willis 1861-1925 was a boat builder; his son Isaiah was noted as a “prolific boat builder.” Van and his wife Hattie Bryant Williams 1868-1957 lived at 220 Water St. Armecia Hill was Van’s sister. 27. Elijah Andrew Sewell 1856-1930 and Emma Webb 1864-1925 were married in 1879. Their children Bessie, Myrtle and Oscar, Sr. are buried here. Elijah was one of the captains of The Charmer, a freight boat first owned by Martin Bloodgood, Sr. and Jr., and later owned by Carl Tolson, brother of Earl. 28. Charles Audrey Lilley 1914-1995 farmed in this area. His wife Naomi’s mother Katie Bell Hassell Gurkin 1889-1984 is also buried here. 29. Neil Clinton Littleton 1919-2000 spent his life as a fisherman. His boat “Troubles” is included in his ephitat: “May Neil Clinton & Troubles find a White Oak River in Heaven.” Brother Errington 1905-1995 was also a life long fisherman, as was their father John William Littleton 1878-1950. Another son Jesse Fitzhugh 1913-1982 was a seafood dealer for over 40 years. John’s wife, Eureka “Retta” Young 1879-1968, and her parents, George R. Young 1847-1917 and Catherine “Katie” Gillett 1860-1947, are all buried here. John’s parents were George and Nellie. 30. Capt. Alexander Moore 1862-1937 married Geneva Moore 1873-1930 and lived at 218 Walnut St. In 1896, he was the first captain of the Core Banks Lifesaving Station and in 1904, he was the first captain of the Bogue Inlet Lifesaving Station. He continued with this profession when the USCG came into existence in 1915. Alex’s parents were (1830) Tyre Moore and Mary Bloodgood. Geneva’s parents were Joseph Francis Moore and Martha “Mattie” Bell. Their grandfathers were brothers. Alex’s daughter Mary Bell 1904-1993 first married William Philip Fournier 1901-1947. 31. Clarence McClender Bloodgood, Sr. 1876-1951 was the son of Martin and Callie. He married Laura Clementine Hill 1882-1962, daughter of Edward Moore Hill and Armecia Gaskins Willis. It is assumed that she is buried between her husband and son Clarence, Jr. 1904-1954 without a marker. 32. William Harden Jones (1846-unk) was captured in the Civil War during August, 1862 while visiting his new wife Euphemia “Fannie” Bloodgood. They were married in June of that year. Their son Ramp was with the USCG and their daughter Lena Jones Hill is buried in this cemetery. 33. Oscar Willie Howland 1883-1954 was a dredge boat operator. He married Ada Jane Bloodgood 1887-1968, great granddaughter of Jane and John. 34. Note tear drop marker. 35. Elenita Woodhull Bloodgood 1895-1940 was the daughter of Timothy and Maude Woodhull. She was the first wife of “Mart” Bloodgood, Jr. 1891-1958. They lived at 116 Water St.
36. Jane Bloodgood 1800-1875 is the second oldest headstone. 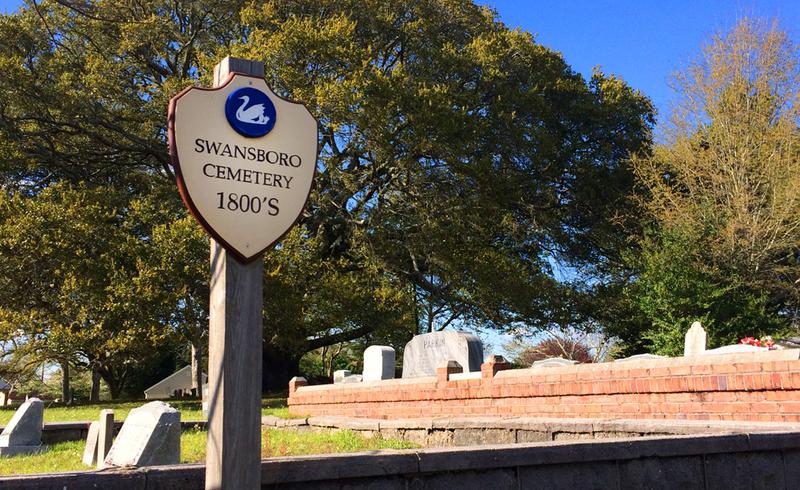 Jane married John Bloodgood and together they started the Bloodgood line in Swansboro. They were the grandparents of Capt. Alexander Moore. 37. Jane Smith Bloodgood Collins 1884-1959 operated a breakfast for party boats (fishing parties) at 133 Front St., where she lived. Her parents were Martin, Sr. and Callie Bloodgood. She was Elenita’s sister-in-law. 38. John Andrew Hill 1875-1918 was a mason. His parents were William Henry Hill, Sr. (1842-unk), a carpenter, and Julia F. Bell 1846-1926. John and his wife Allie Dennis 1881-1911 were the parents of these young children with lambs and doves on their headstones. His daughter Bernice Moore Hill 1902-1920 is also here. Edward Moore Hill 1835-1918 and Armecia Gillett/Gaskins Willis 1846-1929 were the parents of (1866) William Henry Hill, Mary Hill Parkin, Edward Wallace Hill 1876-1926, and Monte Lue Hill , all buried in Ward Cemetery. 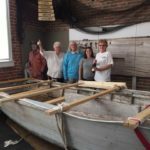 The sons were all involved in boat building and carpentry. 39. Mollie Amelia Littleton Green’s (1876-unk) parents were George and Nellie Littleton. 40. Robert Lee Smith 1871-1943 was Swansboro’s most prolific builder during the lumber boom years. He built at least thirteen houses, the Tarrymore Hotel and many boats. He lived at 202 Walnut St. with his wife Lina H. Russell 1870-1897. Lina’s father Major Russell and her brother Charles T. Russell were also house carpenters. The last house that Robert built was for his daughter Amelia Smith Canady at 114 Water St. Another daughter, Daisy Lee Smith 1897-1995, married Tyre Moore 1896-1964, son of Alexander and Geneva Moore. Tyre was a Lt. Commander in the USCG during WWI and II. Lina’s mother was Mary Amelia Barnum, a relative of P. T. Barnum. 41. Claude R. Frazelle 1854-1911 was a teacher in Swansboro. Many children were named for him. 42. Annie Eliza Littleton 1898-1986 was the daughter of Edward Franklin 1874-1967 and Branca Reed Littleton 1872-1966 whose sons married the Parkin daughters. Annie was involved with the USO during WWII. 43. Kilby/Kirby Tolson 1842-1910 and his wife Mattie 1851-1923 were the parents of Earl and Albert. Early and his bride Georgia Anna Littleton lived at 214 Elm St. Bert lived at 213 Walnut St. In 1894, Kilby and Mattie’s daughter Maude married Daniel Taylor 1856-1932. Most of the families were farmers. 44. Mary Ward Pritchard 1878-1955 was the daughter of Joseph and Martha Bell Moore. She first married David G. Ward 1874-1919, a ships carpenter. After his death, she married Thomas H. Pritchard, Jr. 1883-1945 affiliated with Swansboro Land and Lumber Co. The Pritchards had two homes at various times, 228 Elm St. and 214 Walnut St. David Ward’s parents were George Washington Ward 1835-1905 and Hester R. Gibson. Hester is buried at the Ward/Jones Cemetery. Alvin Elbert Smith 1904-1962 was a dredge boat operator. Many of these Smiths are his and Mary Ward Smith’s 1915-1996 children. Mary’s parents were David and Mary Ward. 45. Isaac Emory Rodgers 1875-1946 was a home builder with Robert Lee Smith. 46. Edgar Leneve Milstead 1907-2005 and Ruby Ward 1914-2005 lived at 408 Church St. Ruby’s parents were Carl and Hepsey. 47. Carl Sanders Ward 1885-1960 was a logger. He and his wife Hepsy Bell Hatsell 1888-1920 lived first at 222 Elm St., then later at 226 Elm St. Notice Hepsy’s brick boat outline. 48. Lucy Bloodgood Buckmaster 1868-1949 was the daughter of Joseph P. Bloodgood and Mary E. Bell. She lived with her husband Calvin Buckmaster 1859-1916 at 204 Church St. He worked as a house painter and at the saw mills. Their son, Joseph S. 1896-1925 was a tugboat fireman and another son Charlie was with the USCG. Lucy’s brother Kanelium “Kay” lived with his wife Elma Howland at 220 Elm St. 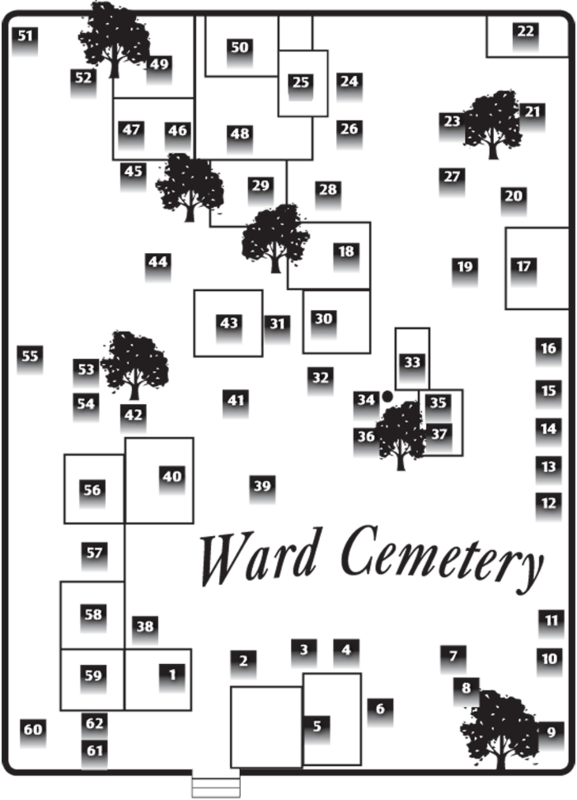 They are buried in Piney Grove Baptist Cemetery. Her parents were Tucker and Josephine Howland. 49. Capt. William P. Ward 1818-1882 was married first to Elizabeth L. Simmons and after her death, to Sarah Nancy Jarman 1820-1910. With his son David George 1852-1925, he amassed a great deal of farm and pine lands. He allowed the townspeople to use this hill as their cemetery. David’s grave is outlined with bricks in the shape of a boat. He married Henrietta B. Freeman 1856-1931 in 1880. The date “1911” on the wall indicates when the plot was outlined. 50. Martin Edward Bloodgood, Sr. 1851-1923 was a sailor; note the outline of a boat. He was the last child of Jane and John Bloodgood. Martin outlined his family plot and dated it “1914” when his wife “Callie” Clara Duffy Moore 1855-1914 died. Her parents were (1805) Tyre Moore and Susan Hatsell. 51. Jesse Thomas Moore 1901-1973 was a BM1 in the USCG during WWII. Wife Nora Belle Piner’s 1903-1993 brother William Henry 1906-1921 is also buried here. 52. Pearl Ward Hatsell 1887-1981 inherited these lands with her brother, Carl S. Ward. 53. Mary Elizabeth Pathroff 1932-1978 was the sister of Keith McKenna Littleton 1934-1967. Their parents were Errington and Irene McKenna Littleton 1904-1993. 54. Aleta Moore Webb Kellum 1911-1986 was the daughter of Charles and Pauline Moore Webb, buried on the far side. 55. Bessie Littleton Darmo 1927-2011 was the daughter of John Albert Littleton, Sr. and Bessie Parkin. 56. William James Furlong 1891-1965 was the son of Thomas and Frances Furlong. His sister Sadie’s husband Frank Elmore Byrd 1907-1982 is buried beside this plot. 57. Mary Louise Privett Underseth 1907-1977 lived with her husband Olai in the Jonathan Green House, c. 1770, at 114 Elm St. Their son Billy, currently living, was responsible for the maintenance of this cemetery for years as a labor of love. Olai came from Norway to help dredge the Intracoastal Waterway. Mary’s parents William Rufus Privett and Nancy “Nannie” Hatsell are in this cemetery. 58. Herma Thompson Odum Privett‘s 1917-1995 father Herman Odum painted the baptistery in the First Baptist Church in Swansboro. It is a lovely, peaceful scene. 59. Horace Joseph Webb 1904-1958 was a merchant. His wife remarried after his death, but she is buried beside Horace. Katherine Fields Meadows Webb Pittman 1915-2003. 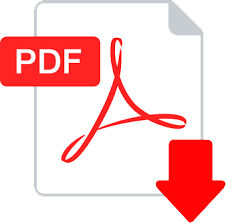 Their daughter Katherine Anna Webb Sermons 1935-1961 lies here. 60. Sgt. Leon Perry Sewell 1915-1989 grew up in his father’s home, Leon Andrew Sewell, at 200 Moore St. His grandmother Rosa Moore Montford 1865-1943 and her parents Nicklaus and Rosa Moore are all buried here. Leon’s paternal grandparents were Elijah and Emma Sewell, on the far side. 61. Leona Moore Cole Carney 1907-1951 was the daughter of Burns and Nona Moore. Her first husband, children and grandchildren are buried in her parents’ plot. 62. Monte Lue Hill 1880-1956 was a boat builder like his father, Edward Moore Hill. His daughter Essie 1917-1971 first married Leonard Benjamin Pridgen; their son Gerald 1937-1988 is buried behind this plot. She then married Leon Perry Sewell.